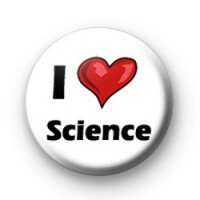 I love science badge in white with black text & a large red love heart. In the style of the classic I Love NY merchandise this is the perfect badge for science teachers to give out to their students & science geeks to wear proudly on their lab coats. From Astrophysicists to biology, chemistry & physics A level or GCSE students this is the perfect badge for all scientists. Standard 25mm badge hand made in our UK workshop from metal components with a copper pin back and plastic coated design. Perfect for schools & colleges.